D8 ADVANCE ECO – Full-sized goniometer class powder XRD, under ambient and non-ambient conditions. D8 ADVANCE Twin – Best powder XRD performance. Push-button switching between amorphous and polycrystalline thin film analysis under ambient and non-ambient conditions. 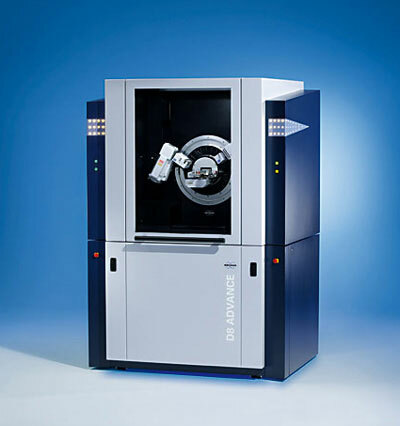 D8 ADVANCE Plus – XRD for all sample types, including epitaxial thin films under ambient and non-ambient conditions. D8 ADVANCE for XRD² – Collect data in both 2Theta and Gamma directions, to study the properties of crystalline materials. D8 ADVANCE for Stress – Measure stress and texture on machined parts, thin films and bulk samples. D8 ADVANCE for Structure Analysis – Gather structural information from X-Ray Powder Diffraction with Rietveld (TOPAS) analysis, diffuse or “total” scattering (PDF analysis) and Small Angle X-Ray Scattering (SAXS). 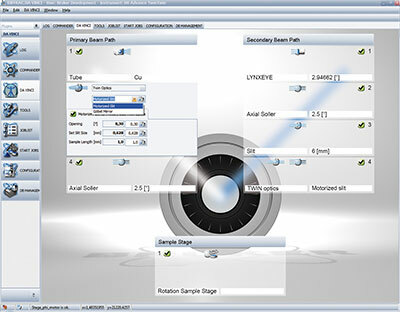 Dynamic Beam Optimisation ensures the highest data quality, with unmatched counting statistics and peak-to-background ratios, without manual instrument reconfiguration. The high speed energy-dispersive detector (LYNXEYE XE-T) uniquely combines fast data collection with unprecedented fluorescence and Kβ radiation filtering. Its proprietary Variable Active Detector Window and Motorised Anti-Scatter Screen (MASS) enable data collection from the lowest 2Th angles without parasitic low-angle background scattering, in particular air scattering. Fully automated MASS retraction avoids beam cropping, even in combination with continuously variable slits for excellent counting statistics across the entire range. Fast data collection and high throughput. Superior data quality for pharmaceutical, clay, zeolite samples and more, with no parasitic low-angle background scattering. Best peak-to-background ratio for greater sensitivity in minor phases. 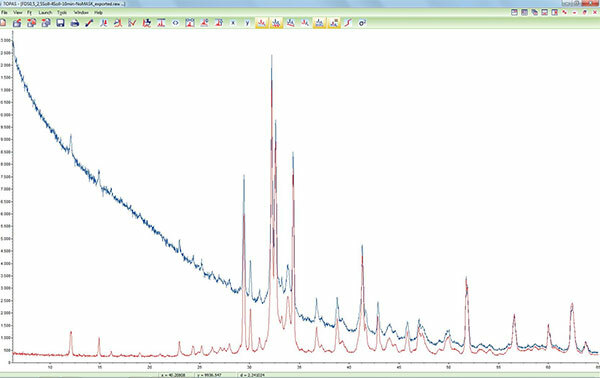 Full quantification of crystalline and amorphous phases. NIST SRM 8486 (Ordinary Portland Clinker). With (red) and without (blue) Motorised Anti-Scatter Screen. Switch easily between beam geometries. Instrument alignment is fully software-controlled, requiring no user intervention. 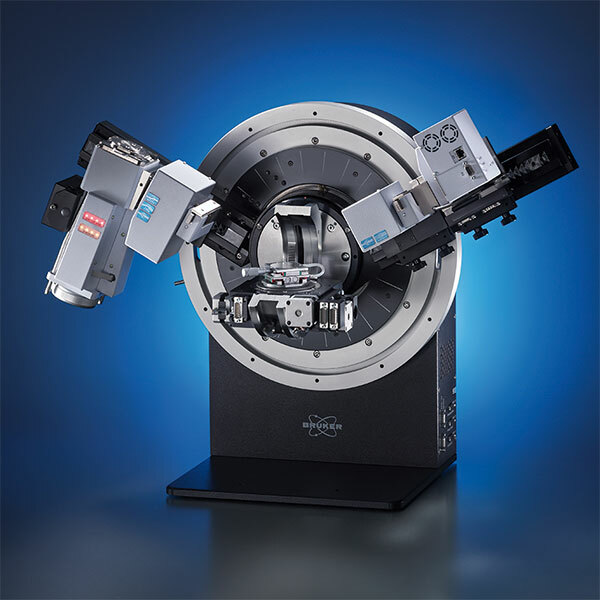 Known as Bruker’s “DAVINCI design”, the D8 ADVANCE is a completely flexible, modular XRD system. It can be adapted easily to any XRD application. 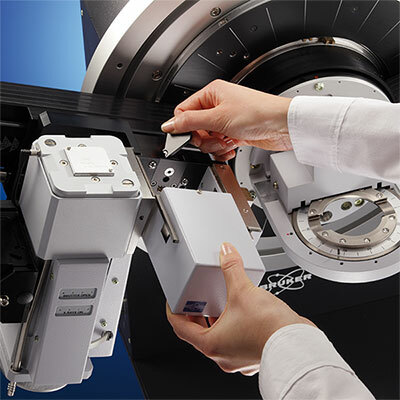 Change easily from one beam geometry to another and exchange individual components, including the the X-ray tube, optics, sample stages and detectors.